Hibiscus Tea, as I have recently discovered, is a delicious, refreshing summer beverage. If you train your palette, it is to summer what sage is to Thanksgiving. I think that heat is most effective in bringing out the flavors of ginger, cloves, star anise and cinnamon so I make a hot tea on the stovetop. Additionally, the syrup is great in multiple applications, read: mixed drinks. Chop the ginger and put in a pot with the cinnamon, cloves and star anise. Steep the aromatics in simmering water for a half hour. Strain out the solids and add in the sugar. Stir to dissolve. If the sugar does not dissolve, add heat until it does. This is your ginger syrup. It should keep fine in the fridge for a month or so but, admittedly, at the point of writing this, I don’t know if I have ever encountered or could detect “bad” syrup. 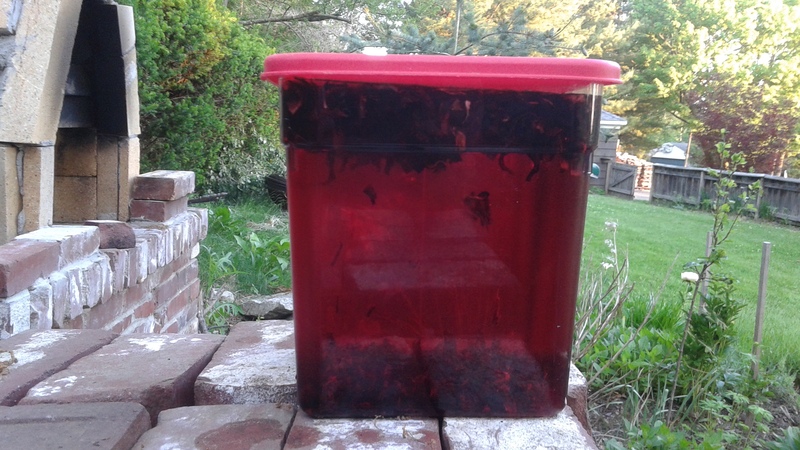 I steep the dried hibiscus flowers in the sun (as opposed to on the stove) for around 18 hours. My preferred batch is 2 gallons and requires 120 grams (3 mega-handfuls) of dried hibiscus flowers. I am not a professional but have never messed this up, so don’t sweat it. When the batch is done brewing, strain out the flowers and add sweetener to taste. I recommend 1 cup of syrup for 2 gallons of tea for a gently seasoned taste. Hibiscus tea on ice with a wedge of orange is pretty fantastic. Here’s the thing: as a New England resident, latin markets are the only place I could find dried hibiscus flowers. They tend to sell a few ounces for a few bucks but that can get expensive if you really like the stuff. However, I recently discovered that the local restaurant supply store (to which I have a membership) sells dried hibiscus in 5 pound bags (which is enough to make 38 gallons of tea) for around $22. Noone really reads this blog, so the risk of random strangers asking me to get them some hibiscus is low. So, hit me up if you want some. Tim, wow! Love the tea. Great job and so detailed. This is THE best! Thanks for the generous instructions. Amazing ! This sounds delicious and beautiful. How can I try some ?